A public-interest litigation filed today in the Supreme Court of India claims that Prime Minister Narendra Modi omitted crucial details regarding land assets in his election affidavits. The petition has been filed by Saket Gokhale, a former journalist who now works as an independent communications and marketing consultant. In an election affidavit filed in 2007, Modi declared that he was the sole owner of Plot 411, in Sector 1, Gandhinagar, in Gujarat. Mentions of this plot are, however, missing from Modi’s subsequent election affidavits—filed in 2012 and 2014—and declarations he has made on the official prime minister’s website every year since he was appointed to the post. Publicly available land records state that Modi is the present and sole owner of Plot 411. In the affidavits and filings since 2012, Modi has declared that he is a “1/4th” owner of “Plot 401/A” in the same sector. At the time of publishing, no such plot was listed in the Gujarat revenue department’s land records for Gandhinagar. Curiously, this same plot of land makes an appearance in the election affidavits and public filings of the finance minister Arun Jaitley. In a 2006 election affidavit, Jaitley declared that he was the sole owner of Plot 401, in Sector 1, Gandhinagar. This plot does not appear in his subsequent filings. In his election affidavit for the 2014 Lok Sabha elections and his public declarations as a minister in Modi’s cabinet, Jaitley listed himself as a “1/4th” owner of the same plot as the prime minister—“Plot 401/A.” Jaitley states in the affidavit that this land was alloted to him by the mamlatdar in Gandhinagar—an office under the district’s collector that is the custodian of land records. Publicly available land records state that Jaitley is the present and sole owner of Plot 401. For several weeks now, The Caravan has been attempting to verify the veracity of the assets declared by Modi in election affidavits and public declarations since 2007—in particular, of how he came to own the Plot 411, and to trace the origins of the “Plot 401/A.” The petition filed in the Supreme Court raises questions about Modi’s ownership of government land in Gandhinagar. Documents accessed by The Caravan raised questions not only about the accuracy of the land details listed in Modi’s affidavit, but also about how he came to own this land—plots in the area are allotted by the state government to members of parliament or the legislative assembly, and public servants. In 2012, while the Supreme Court was hearing an appeal regarding land allotments to government servants in Gujarat, Meenakshi Lekhi, a Bharatiya Janata Party leader who was then the counsel for the state, submitted to the apex court that the Gujarat government had not made any fresh land allotments since the year 2000. Modi was first appointed the chief minister of Gujarat in 2001, and entered the legislative assembly in February 2002, after he won a by-election in the state’s Rajkot-II constituency. 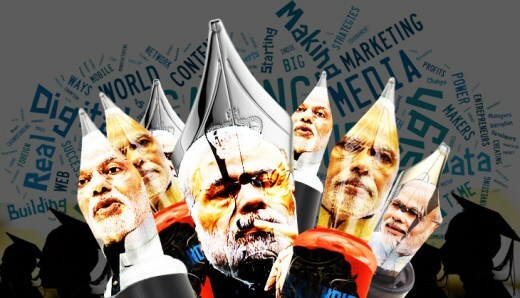 In the past few years, journalists and activists have made several attempts to access records of students who graduated from Delhi University in 1978—the year Modi claims to have obtained his bachelor’s degree from the same university. Those attempting to obtain this information have been stonewalled at various steps, including by the university itself, which refused to release details of its graduates. Our attempt to report the details of Modi’s land assets—which should be rightfully available to the public—was similar. Public-administration departments in Gandhinagar, including the collector’s office, the sub-registrar’s office, and the mamlatdar’s office, either said they had no records available for these plots, or did not respond to our queries despite having been contacted weeks before publishing. Gandhinagar’s Sector 1, comprised of swathes of government-owned land, is a prime locality in the state capital—aside from the prime minister and the finance minister, owners of plots in this area include the BJP president Amit Shah and his predecessor, the former law minister Jana Krishnamurthi, who died in 2007. In 2007, ahead of assembly elections in Gujarat, Modi filed an affidavit with the election commission declaring that he was the sole owner of Plot 411 in Sector 1. Modi listed the area of the plot as 326.22 square metres, and the cost of its purchase as Rs 1.3 lakh. Based on the market rates prevailing in Gandhinagar, this plot is presently worth about Rs 1.18 crore. Modi, then the chief minister of Gujarat, declared in his affidavit that he had spent Rs 30,363 to construct on the land. Modi’s subsequent land declarations, however, do not tally with the details he declared in 2007, nor with public land records. Modi next filed an election affidavit in 2012, when Gujarat went to polls again. Plot 411 is absent from this affidavit. Modi instead listed the plot “401/A,” and declared himself a quarter owner. He listed the area of his share of the plot as 326.11 square metres. This declaration is not supported by the land records accessed by The Caravan, which did not have any records of sales or transfer for Plot 411, and still show Modi as its current owner. His next affidavit was filed ahead of the 2014 Lok Sabha elections. This affidavit, too, does not mention Plot 411. It lists “Plot 401/A,” with details that match his 2012 affidavit. Each year since he became prime minister, Modi and his cabinet ministers have declared their assets and liabilities on the prime minister’s official website, PMINDIA. In each declaration between 2014 and 2018, Modi declared that he owns one-fourth of “401/A.” He listed the area of the plot as 14,125.80 square feet—1,312.3 square metres, which is approximately four times the size of the standard plots in Sector 1. Modi listed his share as 3531.45 square feet—equaling 328.08 square metres. He noted that he invested Rs 2.4 lakh on construction on the plot. The value of his share of the land, according to the declarations, is approximately Rs 1 crore. Modi writes in his affidavits and declarations that he acquired this share of land in October 2002—a little over a year after he was first appointed chief minister of Gujarat—for around Rs 1.3 lakh. He does not explain how this land was acquired. In his 2007 election affidavit (second from top), Narendra Modi declared that he was the sole owner of Plot 411 in Gandhinagar, Gujarat. But in a 2012 election affidavit and a 2015 public declaration on the prime minister’s website (third and fourth from top, respectively), Modi does not mention the plot. Instead, he listed the plot “401/A.” Gujarat’s land-revenue records contain no entry for a plot “401/A” and continues to recognise Modi as the owner of Plot 411.
listed by Jaitley. The finance minister was appointed to Modi’s cabinet in 2014. In his public filings since, Jaitley, too, has listed himself as the owner of “1/4 divided share” of Plot 401/A. In each of his filings, Jaitley declared that he was allotted this land by the mamlatdar in Gandhinagar, and that he acquired this land in May 2003. At the time, he was member of parliament in the Rajya Sabha from Gujarat. Jaitley writes in his 2014 affidavit and subsequent filings that the total area of the plot is approximately 14,240 square feet, or 1322.9 square metres. Jaitley writes that he paid Rs 2.45 lakh for his share of the plot, an area of 3,560 square feet, or 330.7 square metres. He further invested Rs 1.9 lakh in construction on the land. At the market rates currently prevailing in Gandhinagar, his share of the plot would be worth Rs 1.19 crore. This record is however, discordant with previous filings Jaitley made to the election commission of India. In a 2006 affidavit, Jaitley declared that he was the sole owner of Plot 401 in the same sector, measuring 326.22 square metres. Mentions of this sole ownership are missing from his election affidavit for the 2014 Lok Sabha elections and the public declarations he filed as a cabinet minister. Arun Jaitley’s 2006 election affidavit (second from top) lists a property, “Plot No. 401” in Gandhinagar, Gujarat, but the same plot is missing from his 2014 Lok Sabha election affidavit (third from top), and from a 2016 public declaration on the prime minister’s website (bottom). In these, Jaitley declares that he is a one-fourth owner of plot “401/A,” but Gujarat’s land-revenue department contains no record of such a plot. Adjacent to the plot marked “410” stood a bungalow. Across the street from the bungalow was another large empty plot. As we approached the gate of the bungalow, in order to speak to its residents, a middle-aged man asked us to enter the compound. When we introduced ourselves as journalists, he insisted on seeing our identity cards and our phones. Upon showing these, we asked his name but he did not reveal it. He then called the police, and repeatedly told the person at the other end of the line that we had come to see “Saheb’s plot.” We inquired several times whom he meant when he said “Saheb.” Eventually, he said, “Narendrabhai Modi.” He gestured towards the adjacent piece of land—the several-times larger plot, numbered 410—indicating that he was referring to “Saheb” as its owner. Revenue department records list Prafull Dwarkadas Goradia as the owner of plot 410. Goradia is a former BJP MP to the Rajya Sabha from Gujarat. While we were leaving the area, we received a call. The person on the line did not identify himself, but claimed to be calling from the local police station and began questioning us aggressively. He asked if we had come to “Modiji’s bungalow,” and further inquired about our whereabouts. When we explained that we were journalists, he demanded to know what we were looking into. He then asked if we had taken “permission” before conducting reporting. He claimed that we should have informed the police. “If you journalists want any information, you have to inform the police before doing such things,” he said. At the time of publishing, the Gujarat land-revenue department’s property card for Plot 411 situated in Sector 1 in Gandhinagar listed Narendra Modi as its owner. At the time of publishing, the Gujarat land-revenue department’s property card for Plot 401 situated in Sector 1 in Gandhinagar listed Arun Jaitley as its owner. The Caravan made several attempts to ascertain the history of ownership of the plots 411, 401 and “401/A.” If, as Meenakshi Lekhi submitted to the Supreme Court, the state of Gujarat has not made any fresh allotments of land to government servants since 2000, it remains unclear how Modi, who first got on the government’s payroll in 2001, came to own government land. Since 1969, the Gujarat government has passed a series of resolutions governing the procedure for land allotments to the state’s public servants, members of parliament and members of legislative assembly. In the third such government resolution, issued in 1982, the state decided to allot residential plots measuring between 200 and 330 square metres to MPs and MLAs, without auction, at a rate of Rs 45 per square metre. Upon receiving applications from several social, religious and educational organisations seeking an allotment of land, the Gujarat government revised its policy on land allocations through another government resolution, issued on 29 June 1988. The 1988 resolution added various caveats to the one passed six years earlier. For instance, a government employee allotted a plot had to construct a house within two years of taking possession of the plot and “reside compulsorily in that house.” Moreover, the government employee was prohibited from transferring a vacant plot, and the transfer of any plot with construction on it was only permitted with prior permission of the government. The stringent conditions imposed in the 1988 order were relaxed after the government employees began raising concerns, such as transfers out of Gandhinagar. In 1999 and 2000, the Gujarat government issued two more resolutions easing the requirements of the earlier policy—significantly, that the plot could be given on rent with prior permission from the state. Though both resolutions prohibited allottees from renting the plot for commercial purposes, the relaxation of the 1988 policy seemingly led to misuse of allocated land. In 2000, the government resolutions came to be challenged before the Gujarat high court after it took suo moto cognisance of a letter alleging irregularities in the allotment process. Through three interim orders passed in April 2001, the Gujarat high court issued a temporary stay on the government resolutions issued in 1999 and 2000, directed the state to recover the rent on the plots that were rented out without prior permission, and issued a stay on any further transfer of or construction on the allotted plots. Immediately, the Gujarat government challenged the high court’s decision before the Supreme Court, which issued a stay on the high court’s orders in November 2001. As a result, the 1999 and 2000 government resolutions continued to be in effect—meaning that government-allotted plots could be sold with its permission—while the Gujarat high court’s suo-moto petition challenging the resolutions remained pending before the court. In April 2001, NK Patel, who was a deputy secretary in the state government at the time, filed an affidavit before the high court submitting that as of then, around 14,000 plots had been allotted under the government resolutions, and that the permission to sell had been granted for around 1,100 plots. The court added, “We, however, direct that till the High Court disposes of the Suo Motu action, no further allotments or permission to transfer the plots already allotted under the Government Resolutions in question, would be granted without the leave of the High Court.” It was in this order that the court recorded an important assertion by the state government’s counsel—the advocate and BJP leader Meenakshi Lekhi—that the state government “has not made any afresh allotments after the year 2000” and that the entire procedure for allotments was being reexamined. In August 2017, the suo-moto case before the Gujarat high court remained pending as one judge after the other recused themselves from the hearing, prompting the Supreme Court to transfer the case to itself, and hear it together with Barot’s appeal. The cases are still pending before the apex court. The court tussle over the alleged irregularities in land allotment meant that between 2001 and 2012, government employees who were alloted land in Gandhinagar would have been allowed to sell or transfer their plots, albeit with the government’s permission. Following the Supreme Court’s orders, after 2012, any sale or transfer would have required the permission of the high court. Revenue-department records for the plots in Sector 1, Gandhinagar, also show that these are governed by “K-4”—a government directive stating that sale or transfer of these plots can only take place with the permission of the district collector. This raises several questions: if Modi, who was not a government employee until 2001 and not an MLA until 2002, was not alloted this government land, did he purchase it? What happened then to Plot 411, and how was “Plot 401/A” acquired? Did the collector grant clearances for these actions? On 30 March, we visited the office of director of land records, situated in Sector 14 in Gandhinagar. The officials present there said that they would not be able to help with land-allocation documents and directed us to the Gandhinagar Urban Development Authority. An officer at the GUDA office said that the office had held documents and details on land allocation until about five years ago. “After that, all documents had been transferred to the mamlatdar’s office,” he said. The mamlatdar’s office is part of the collectorate and in the same building as the collector’s office. We met the mamlatdar, KA Shikari. He said that he had recently taken charge of the office, and that he was “busy with election work” and could not help with obtaining details of land allocation. We visited the sub-registrar’s office, where citizens can file forms to obtain “search reports” for government-alloted land—these records would indicate all current and previous owners of any plot, and any loans raised against the land. The search reports for the plots 411 and 401 contained one line: “No data available.” Upon enquiring further, we were told that the search reports were digitised beginning in 2007, and that no data for any prior years was available. That no data on these plots is available indicates that the revenue-department records accessed by The Caravan are accurate—Modi declared Plot 411 in his 2007 affidavit, and listed himself as its sole owner. Had he sold the plot or disposed of it in any manner, records of these transactions would have appeared in the search report. We sent detailed queries to the collector’s office on 28 March, inquiring about the ownership history of the plots 411, 401 and for details on what “401/A” signifies and why it was absent from the property cards we accessed. On 31 March, we received a response from the collector, SK Langa, acknowledging our email, and stating, “Necessary reply would be sent in due course.” We contacted Langa again in early April, and were told to wait until 8 April for a response. After 8 April, when we contacted him, the collector said that he was busy and asked us to wait until 25 April. Interestingly, Modi’s rally in Varanasi, where he is will file his latest election affidavit, is scheduled for 26 April. Put together, the queries raised by Gokhale’s PIL, the discrepancies in Modi and Jaitley’s affidavits and public declarations, and The Caravan’s reporting on the land they claim to own, result in grave concerns regarding the veracity of the prime minister’s election affidavit. According to the Representation of People’s Act, the election affidavit of a candidate contesting for Parliament should list their assets and liabilities. Under the act, filing false information in an electoral affidavit is liable to be punished with rejection of the nomination.